Jeff Skaggs, Jay Post, and John Lombardo prepare for “Fire in the Sky” fireworks show in Washington C.H. that is scheduled for tonight. It’s going to be a hot week in Fayette County and surrounding areas during the Fourth of July activities. Temperatures are expected to climb into the 80s every day and to reach as high as 91 degrees Wednesday, July 4. The warm weather will be tempered by scattered thunderstorms throughout the week. There is a 50 percent chance of rain today. Fortunately, however, the hourly forecast on weather.com predicts that these storms will occur during the afternoon, long before the first fireworks are due to be set off at the Fayette County Fairgrounds. Even if it does rain during the fireworks display, the show will go on unless there is a severe storm, according to Dan Fowler, chair of Fayette County Fire in the Sky. If it does storm, the show will be rescheduled for Wednesday. On July 4, there is only a 20 percent chance of rain, and temperatures are expected to reach 91 degrees. If you’re going to the Jeffersonville Block Party, be sure to load up on that sunscreen and drink plenty of water. The heat should break a bit by the time the fireworks show begins, which will be around 10 p.m. While the fireworks shows in Washington Court House and Jeffersonville are sure to delight thousands of people, it’s important to keep in mind that your pets will not be delighted by the noise of the explosions. In fact, according to prnewswire.com, more dogs run away on the Fourth of July than on any other day of the year. With this in mind, pets should be locked securely inside interior rooms where they’ll be shielded from the noise of the fireworks. Despite the two public, professionally-produced fireworks displays that members of the Fayette County community can enjoy on July 3 and 4, it is likely that the crack of illegal fireworks will be heard throughout many neighborhoods. In Ohio, it is illegal to set off most kinds of fireworks without a high-level permit. The only fireworks that may legally be discharged by unlicensed individuals are “novelty and trick” fireworks, such as party poppers and glow worms. Nevertheless, higher-grade, illegal fireworks are set off every year by unlicensed individuals. It is important to remember that fireworks are dangerous explosives and must be treated with care. According to fireworkssafety.org, fireworks should never be handled by a child or by anyone who is under the influence of alcohol or drugs. If a “dud” firework does not go off the first time it is lit, it should never be re-lit. These “duds” and all spent fireworks should be soaked in water before being discarded in a metal trashcan far away from combustible items. 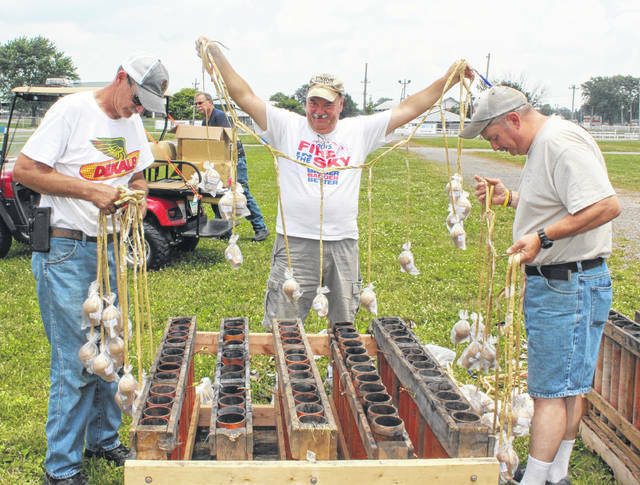 https://www.recordherald.com/wp-content/uploads/sites/27/2018/07/web1_fire-works-weather-report-edited.jpgJeff Skaggs, Jay Post, and John Lombardo prepare for “Fire in the Sky” fireworks show in Washington C.H. that is scheduled for tonight.